Southern Matriarch: So who is your best friend? Mine seems to be a seam ripper. 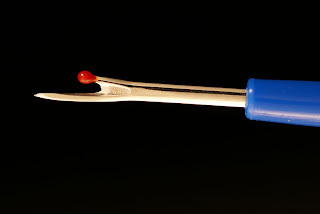 Or reverse sewing tool, unpicker, or another term according to Wikipedia threader-er remover. Shoot, it seems almost more difficult to say than to use. But I am very adept with a seam ripper. And this little dress seems to have chosen to be my muse in learning all ways to use it. Have you ever just had that project that no matter what you did, it seemed you needed to do it two or three times? a back armhole curve! I was so intent on getting the back skirt gathered onto the yoke I forgot to cut out the armhole curve. That is sure going to make it tough to set in a sleeve. I picked up my seam ripper once again when I realized one of my cardinal rules; "When you have to start ripping late at night, it is time to call it a night!" And this is what I did. So this morning I am off to take off the skirt, cut the curve, regather and restitch. And wouldn't you know, this would be one of those times that the skirt went on without a hitch, my gathers were nice and even and no "caught" gathers. *&^%! One reminder that maybe you haven't thought of, notice too that the fabric has frayed, this poly cotton twill has done that a good bit. When I get ready to sew my seam, I will use the edge of the fray as my raw edge. 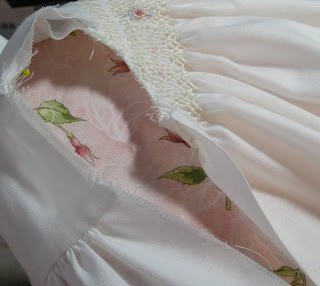 In the past I didn't like those frayed edges and would trim it off, only then to wonder why did the pieces did not fit together properly or the garment not fit. That edge is your original cut edge. If both of the pieces I sew together had frayed that way and I trimmed them, that could possibly be 1/8" off both pieces resulting in 1/4" off that seam and a total of 1/2" across the width, in this case, of the bodice. It all adds up. On this garment it might not be that detrimental, but if you were talking about a straight sleeve that was a slimmer fit, you would have a sleeve that was too tight and a garment that was not at all comfortable. So to avoid that, handle your cut pieces as little as possible, trim your threads but not the cut edge and match up the original cut edges. I cannot begin to tell you how many times I have done that same thing. Is that some sort of disorder, you think???? Well, anyway welcome to the club and I hope you are not a repeat performer like me!!!!! Hope you post a pic of that finished project soon!!!! Thanks guys, my relationship with my seam ripper seems to be pretty intense right now. The dress is hanging up right now drying.